Fauzia Minallah is a Pakistani artist, filmmaker, author, educator, disability rights activist, all rolled into one, and more, which is why it is futile to look for a one-word descriptor that can neatly sum up this resident of Islamabad. The first time I met her was in October 2013, at the Children’s Literature Festival in Lahore, organized by Idara-e-Taleem-o-Agahi and Oxford University Press Pakistan. And I have been following her work ever since because it speaks directly to concerns around diversity, conflict, and violence. In her book Chitarkari and Banyans: The Pursuit of Identity, Minallah has written movingly about her childhood memories of Sirikot in Pakistan, of playing in the cemeteries among slate tombs bearing floral and geometric designs. Much of her artistic and pedagogic practice draws inspiration from that early immersion in her cultural heritage, though her formal training happened at the Pratt Institute in New York. Minallah is now planning a picture book for children on the life of Abdul Sattar Edhi, a humanitarian who ran orphanages, hospitals, homeless shelters, and rehabilitation centres all across Pakistan, and led a life of simplicity, refusing to discriminate between people on the basis of religion while extending support services. We bring you, in her own words, Minallah’s efforts to inspire in children a love of art that thrives in their surroundings and their traditions, not just in books, art galleries, and the Internet. A number of activists and researchers in Pakistan, like A.H. Nayyar and Rubina Saigol and many others have campaigned for the reform of curriculum for Pakistani children. Sadly, like many other countries, in Pakistan too, children are given an exclusionary worldview in the name of nationalism. In this globalized world, we need to educate children to be better citizens of the world. My contribution as an author and illustrator for children’s books is to work on subjects not easily available to children. I believe that if children respect the rich heritage of Pakistan, it would cultivate diversity and multiculturalism. 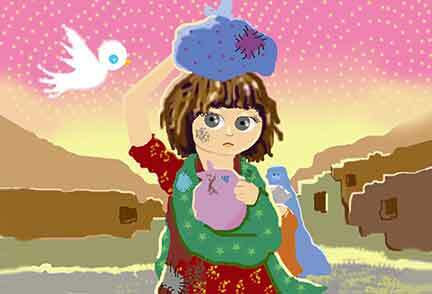 I created a cartoon character ‘Amai the bird of light’ as a vehicle through which I tell them about the beauty of this world. She is a tiny bird made of light that turns into a shooting star, and takes children on exciting adventures. It is not very popular now but, when I was a kid, I used to love playing with paper dolls. My book Bano, Billoo, and Amai grew from that experience. In this book, through traditional dresses in different provinces of Pakistan, children learn that there are Hindus in Tharparkar or a tribe in Kalash that practices an ancient religion. 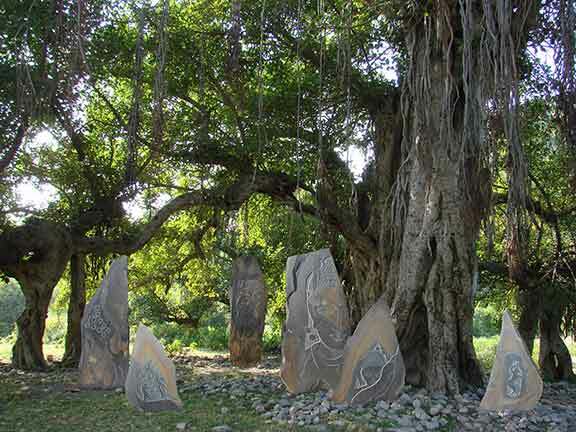 In Amai and the Banyan Tree, Amai introduces the two main characters of my book Seema and Ali to a banyan tree, ‘Ma banyan’. This book is not only about the environment but came out of great sadness that I experienced when a very old banyan tree called ‘Buddha tree’ in Islamabad was burnt down by some seminarians. In fact I saw a Japanese children’s book writer Tajima Shinji cry when I took him to the site, and he couldn’t believe why someone would destroy something so beautiful. 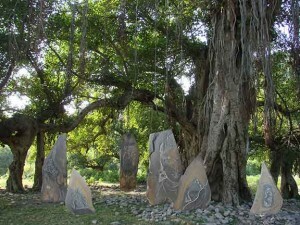 Ever since then the banyan has not only become an inspiration for my art but have tried to save some in Islamabad. It was all the more important for me to write about the beauty of these magnificent trees for children. It is a beautiful symbol of peace. In a number of religions, some trees are more sacred than others, but when I sit under a tree, it has never asked me about my religion. It has given me shade whenever I needed it. Our sub-continent was a place on earth where different religions co-existed for centuries. Of course, it was not a haven of peace, but I think in this volatile world there are many lessons in co-existence one can learn from our past. The partition is a colossal tragedy that should never be repeated but there are many more stories of Muslims, Hindus, Sikhs living in the same communities without conflict. I will give you an example of not only the visits to our ancestral village Sirikot that exposed me to the beautiful craft of Chitarkari but the stories of my mother’s childhood where she would play with Hindu girls, had Hindu neighbours, and they participated in each other’s festivities. That area was not affected with the madness of Partition. On the contrary, when they heard the news of widespread religious violence, the Muslim neighbours protected the Hindus and made sure they crossed the border safely. This is the ‘respect for our roots’ we grew up with. These stories of co-existence and multiculturalism have become all the more important today. South Asia has a rich past. Every temple and mosque is decorated with stunning craftsmanship. Children need to respect their roots and heritage. For example, we had traditional potters in a village called Saidpur, which is in Islamabad. I organized a number of school trips to the village where the children interacted with the potters. Every city, town, and village in South Asia has traditional craftspeople. We need to promote their work, and school visits should be organized where children are exposed to the beauty of their craft as a part of their art activities. Their own creative expression will benefit from this exposure. Sadly, with industrialization, many traditional crafts are dying out. If we start using them in our homes, and promote them at every level, I feel they will be alive in future too. Art education in our part of the world is very ‘Westernized’. It needs to have a local flavour too. While it is important for children to know Western painters, it is also important that they are exposed to their own artistic heritage. When I planned Amai’s Park in a school for visually impaired children, I was told by many people, even the teachers, that blind children don’t need parks. Thank God, the director of the government institution that I was working with was absolutely supportive. When the project was completed, it was a joy to watch the children go up the monkey bars or slide down the slides. Of course, we made sure that all the slides and swings were customized with special barriers with bells so that they don’t fall from the slides. But sadly, like many government institutions, the maintenance is much to be desired. It has been almost 11 years since the park was created, and the kids love using it. 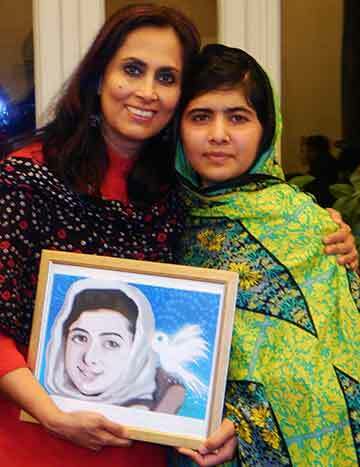 ‘Young People for a Peaceful and Tolerant Society’ is a peace activist’s dream project. It was also a significant educational opportunity for me. Pakistani society is greatly segregated along class and ideological lines. There is a growing need for greater opportunities of dialogue between different segments of society. This project gave young people an opportunity to express themselves. The project involved students from diverse backgrounds and social strata, even from madrassahs, to work on art based projects (calligraphy and painting) that offered them a platform to share their ideas and vision. Facilitated by the Centre for Civic Education Pakistan, this project was organized in Lahore, Islamabad, Peshawar, Karachi, Quetta, and Mirpur. Renowned artists like Ustad Khurshid Alam, Gauhar Qalam, Ghulam Rasul, Rahat Saeed, Ghalib Baqir, Tayyaba Aziz, Ghulam Shabbier, Kaleem Khan, Usman Ghauri and many were mentors. Since we had some madrassah students too, we had the option of calligraphy. Most of the students had limited exposure while some were painting for the first time. The aim of these workshops was more about expression of ideas, thoughts, and feelings. For example, the second prize was awarded to 15 year old Syed Mudassar of Idara Taalimi Islami, for the beautiful message conveyed in his painting, and also considering that coming from a madrassah he opted for painting rather than calligraphy. Obtaining great pieces of art was not the main aim of this workshop but rather ensuring that the process was a sensitive human interaction with students, some of whom have never painted in their lives before. But the most valuable experience was that young people who would typically not interact with each other were able to, despite coming from very diverse backgrounds.